This summer, kids can take a break from school and transit fares. Up to three children aged 12 and under can ride RTA for free when accompanied by a fare-paying adult who is 18 or older. This offer runs from Sunday, June 3, through Saturday, August 11. RTA is working with many different partners, sponsors, and venues to raise awareness of the many family-friendly opportunities available throughout the city. And we want to provide the fun, convenient, and affordable transportation to these events whenever possible, which is how Kids Ride Free came about. We ran this program last year, and it was a hit with riders: we provided free transportation for over 65,000 kids. Because it was so successful, we decided to do it again this year. We hope you’ll take advantage of RTA and all the summer fun that Cleveland has to offer! And as always, showing your same-day RTA Farecard or mobile ticket provides discounts year-round at many restaurant and entertainment venues in the area, everywhere from the Cleveland Metroparks Zoo to Tremont Scoops to Great Lakes Science Center. A complete list of our partners is available here. RTA is proud to announce the U.S. Department of Transportation is investing more than $2.6 million to be used for the conversion of diesel to Compressed Natural Gas (CNG) fueling at the Triskett District facility. The DOT grant calls for the facility to serve as a CNG public fueling facility, so neighboring municipalities, as well as public entities, will be able to use this facility to fuel CNG vehicles. We also received a $400,000 grant from the Ohio EPA to help cover the $25,000 difference between the cost of a diesel and a CNG bus. RTA CEO and General Manager Joe Calabrese said, “We’d like to thank our elected federal officials for their advocacy…RTA can now save more than $200,000 over the life of each vehicle.” The funds will go toward the cost of 16 of RTA’s 33 new CNG buses currently on order. We plan to order another 27 CNG buses in 2019. Within our bus fleet, 106 of the 453 vehicles are fueled by CNG. More than 850 companies and organizations and over 15,000 employees now participate in Commuter Advantage, a unique opportunity for employees to enjoy an added discount on public transportation fares through their employers. For more information, have your benefits managers, HR Directors, or company principals contact sales director Jim Frick. Flat Out Fridays is a free summer concert series, and it kicks off at 7 p.m. on June 8 with a performance by alt-rock band Binge Red. You can enjoy any of The Flats restaurants, or buy from local vendors who will be set up along the Cuyahoga River. Proceeds will benefit a local nonprofit. Avoid the hassle (and expense!) of parking, and go RTA. The Flats East Bank is served by the C-Line Trolley. The service operates 7–11 p.m. Monday–Friday, and 11 a.m.–11 p.m. Saturday and Sunday, with Trolleys running every 10 minutes. It’s free with a smile! These concerts take place on the second Friday of each month, so you can catch the next act on Friday, July 13. University Circle’s free signature event takes place Saturday, June 9. There’s fun for the whole family, kicking off with a parade at noon and continuing until 4 p.m. It’s a day filled with activities, live music, art, and local food vendors. Don’t circle parking lots looking for a space: go RTA! Take the Red Line rail to the Little Italy-University Circle stop. University Circle is just a short walk from the station, and then you can start your Circle celebration. And for other fun in the neighborhood, stop by Wade Oval Wednesdays, where bands perform free concerts from 6–9 p.m. on the beautiful Wade Oval lawn, beginning June 13 and running all summer long. Dance the night away on the shore of Lake Erie every Thursday throughout summer. These free concerts begin at 4:30 p.m. with an opening act presented by Tri-C and are followed by a headlining performance from 6–9 p.m. Enjoy a rotation of food trucks and the Edgewater Nature Shop. New this year, the shop will allow beachgoers to rent stand-up paddle boards, umbrellas, and chairs to make for an even more fun and convenient experience. Between construction on the Shoreway and big crowds, RTA is your best bet. Take the Cleveland State Line to the Clifton-Lake stop, or the #26 to Detroit-W. 73 stop, for a hassle-free ride to this lively community event. 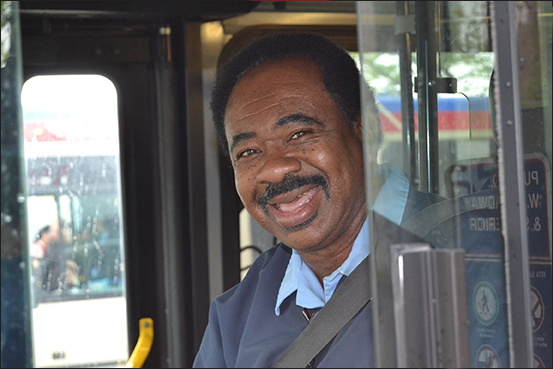 For over 40 years, RTA operator Godwin McNeal has been navigating the streets of Cleveland. And even more impressive is the fact that in all of his years of driving, Mr. McNeal has never been involved in a preventable accident. He’s logged over 1.2 million miles without incident, the longest streak in RTA history by far. He’s earned bronze, silver, and gold awards for his dedication to safety, and has even thrown the first pitch at a Cleveland Indians game! Whether a rider or a driver, that’s a lesson we can all learn from. Thanks for your commitment to safety, Godwin! Transit Police offer these tips to help you stay safe this summer, especially when you find yourself stuck in traffic or wading through large crowds. Pedestrians: Use crosswalks, obey traffic signals, and watch for vehicles. Avoid distractions like texting or wearing headphones while crossing the street. Be alert; look and listen for vehicles. Secure your belongings and protect your electronic devices. On the Rapid, read the emergency evacuation procedures above the doors. See Something, Say Something: Call Transit Police 24/7 at 216-566-5163, or text 575-EYES, to report any safety or security concerns via text, video, or photo. Plan ahead: During special events, buses may detour off their regular routes. Check Service Alerts on rideRTA.com. Automated service on the RTAnswerline (216-621-9500) is available 24/7 or use the Transit App for push notifications and real-time bus/train tracking. Listen to the radio for traffic updates. Leave home early and allow plenty of time for your trip. Follow directions: Transit Police and RTA staff work hard during special events to provide you with a safe, enjoyable trip. Transit Police—both uniformed and plainclothes officers—will enforce regulations. Your cooperation is much appreciated.